There’s no such thing as a good way to lose in the playoffs, but the worst way might be getting swept in the first round. It also might not, I don’t know, but it can feel so unfairly abrupt. The Rangers spent six months working on building the best record in the entire American League. It all came to an end in three games. That quickly, the mental calendar flips, and after another year spent entertaining dreams of the World Series, it’s time now for the Rangers to think about the season to come. And this promises to be a difficult offseason for them. In fairness, it’s always some kind of difficult offseason for everyone, every time. But the Rangers need to identify exactly where they stand. And there are going to be several holes for them to fill, with limited financial flexibility. Nothing about next year’s Rangers is guaranteed, and there’s work to be done if they want to even contend. The Astros are the early, early favorite, which probably isn’t a shock. Then there’s essentially a tie between the Angels and the Mariners. Maybe it’s weird to see the Angels up so high, I don’t know, but in their defense they might indeed be getting Garrett Richards back. The Rangers are almost five wins removed from them, putting them closer to the last-place A’s. The Rangers just had the league’s best record, but just by these numbers alone, they don’t profile so much better than a 2016 cellar-dweller. 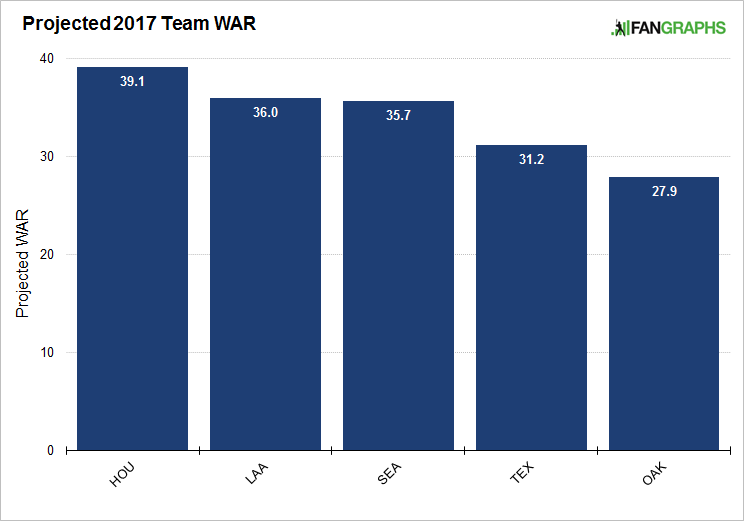 The Astros just led the division in WAR, easily. The Rangers were a distant third, barely any better than the Angels. The Rangers won 21 more games than the Angels. The Rangers won nine more games than the second-place team. We all know what went down in 2016 — the Rangers did something extraordinary, dramatically out-playing virtually all of their statistical indicators. Forget fluke-y or non-fluke-y. It was something magical. It was legitimately amazing! The Rangers clutched like few teams have ever clutched, and I’m sure that led to more than a few fans getting the feeling like it could be a team of destiny. The reality of the matter, though, is this: Almost no one has done what the Rangers did. It would be almost impossible to repeat, and if you had to choose, you’d prefer to look good in the projections. The projections, after all, are just based on what players have actually done. There might be something special about the Rangers, and maybe you want to toss them a few extra wins because you’re a huge believer in Jeff Banister’s clubhouse environment, but the road ahead will be challenging. The 2017 AL West is unlikely to provide an easy title. What you can say for the Rangers is that they’ve preserved a solid core group. Moving ahead, their rotation is still topped by Cole Hamels and Yu Darvish. 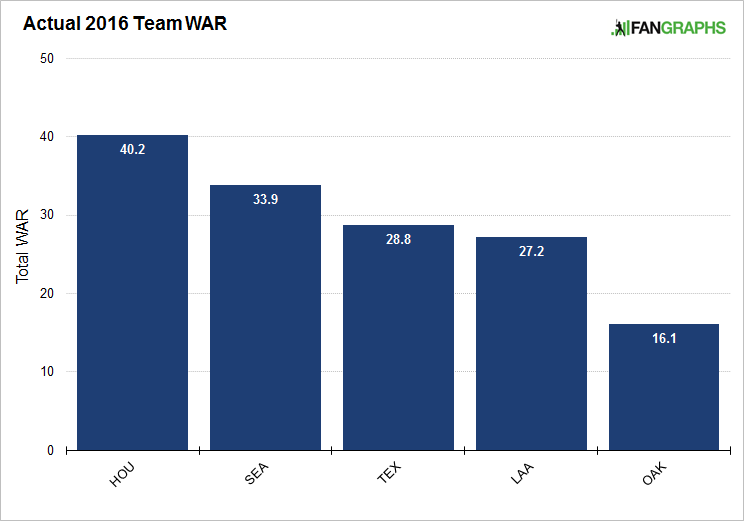 The infield will still include Adrian Beltre and Jonathan Lucroy, and both Elvis Andrus and Rougned Odor were just above-average hitters. The bullpen should again be deep. Nomar Mazara just managed a full season while turning 21. When you move past that, things thin out quickly. There are big questions at first base, center field, and DH, at least, and there’s not much in the way of rotation depth. The Rangers just began with a payroll of nearly $160 million. As of right now, my projected roster for the Rangers would have a payroll of about $145 million. You could knock almost $10 million off that by having the Rangers decline Derek Holland’s option, but then, they’d be looking for another starter. There’s not so much wiggle room, and for what feels like the first time in a while, the farm is relatively thin. Two names could loom awfully large. And as I get into this, I want to point you to a recent NEIFI post, about the Rangers’ organizational future. The title of the post, written even before the ALDS elimination: “The Texas Rangers Might Be Finished.” The post is down on the team’s future prospects, especially with Lucroy and Darvish a year away from free agency. What the team could really use are some young, helpful, long-term pieces. Jurickson Profar is somehow still just 23. Joey Gallo turns 23 in a month. Profar was once Baseball America’s No. 1 overall prospect. Gallo has ranked in the top 10. I don’t need to tell you who these players are. It’s always been easy to dream on each. And yet, Profar just posted a 78 wRC+, over more than 300 trips to the plate. He matched what he did before all the injuries, and though he’s shown good discipline, Statcast hasn’t shown him to hit the ball too hard. As for Gallo, he didn’t have a bad year, but he didn’t have a great one, either, and at times it felt like the Rangers were trying to hide him. He still hit for power, but he still struck out, and he’s unlikely to ever win a Gold Glove. So much could depend on both of these players. In theory, if Profar and Gallo are both ready for prime-time, the 2017 Rangers could have Profar in center and Gallo at first. That would be two holes plugged cheaply, and with long-term assets. It would greatly improve the Rangers’ future forecast. Things are worse if one of them isn’t good enough. And if neither player is good enough — I don’t know when the Rangers would find that out, but then they could be really up against it. Neither player is a certain bust, but the Rangers need an infusion of youth, and this infusion might not be sufficient. There’s volatility, then. And I’m not sure the players could be easily flipped. There’s long been an industry view that Profar has been overrated, and his 2016 didn’t exactly open many eyes. There’s no shortage of teams that would like to take a chance on Gallo, but he’s so risky he’d be unlikely to get what the Rangers would want in return. It feels like the players are theirs to make the most of, unless they elect to cut bait and try to build a big trade package. That approach, of course, would carry its own risk. The way things are lined up now, the Rangers are positioned to trade from their bullpen depth. That’s something; good relievers are highly valued. A talented bullpen would remain, and that’s one of the reasons why the 2017 Rangers shouldn’t have the bottom fall out. But for the organization, 2016 is more or less over, and now comes the hard part. The Astros are an organization still on the rise. Many people have talked about the Mariners facing a cliff, and many others have suggested the Angels and A’s have already fallen off theirs. The Rangers could be approaching a cliff of their own. So much could come down to a couple of former top prospects, and there are worse positions to be in, I suppose. It’s just going to be tough to win another 95 games. I’m far from sold on 85. We hoped you liked reading The Rangers Are Facing a Difficult Winter by Jeff Sullivan! Thanks Jeff! One thing; the Rangers will have Shin Soo Choo who will most likely get the DH duties going forward. It’s not ideal, but if he can stay healthy he should provide some value out of a position that has mostly been a black hole. As for starting rotation help Yohander Mendez might be starting to force some conversation before long. 2017 will be very interesting. It wouldn’t surprise me to see them in the mix at the trade deadline, nor would it completely surprise me to see them as sellers. Unless I’m missing something, isn’t Choo penciled in at RF for 2017? He might be a better fit as a DH, but you’d be plugging one hole just to open up another. I wouldn’t put a lot of confidence in them plugging and playing Yohander Mendez or any other SP prospect.